Back in the days before the release of Windows 95, just as the public was discovering the Internet as an alternative to private networks such as Prodigy and CompuServe, Netscape was the bomb. In those days, Microsoft didn’t supply any method for surfing the Internet, so people visited their local Egghead store, or other software outlets, to buy a shrink wrapped version of Netscape on floppy disks, which opened up a whole new world to computer users. Microsoft’s reaction? Just before the release of Windows 95, Bill Gates said words to the effect of “we’re not interested in the Internet. We’re just going to do what we’ve always done, which is produce a standalone operating system.” Mr. Gates soon changed his mind, however, and very soon Microsoft was building Internet Explorer into their operating system and offering it for free with the cost of admission into the Windows world. Why the change of heart? Had the folks in Redmond seen the light and embraced the Internet? Hardly. Evidently someone whispered in Gates ear, making him aware of the fact that the Netscape browser could very easily morph into an operating system that could compete with MS DOS or Windows. Internet Explorer eventually killed Netscape, which couldn’t compete with free. For a time, Internet Explorer was just about the only browser available, except to those who used Linux, BSD or Unix. Netscape, of course, rose from the dead as the Mozilla Suite, which spawned Firefox and eventually gave birth to Firefox OS. In a weird and convoluted way, Firefox OS is the Netscape operating system that Mr. Gates feared almost twenty years ago. When Firefox OS was first announced a couple of years back, hardly anybody gave it much chance of success. As a mobile operating system, the competition from Apple and Android seemed to be too much to overcome. Even Mozilla figured it would mainly be picked-up in third world countries as a low cost alternative. 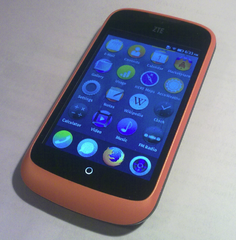 However, Firefox OS has a couple of things going for it that the competition lacks. For one, it’s completely open, much more open than iOS and even more open than Android and Chrome. For two, it’s completely based on HTML5. That last, the HTML5 integration, is most important and it’s behind the reason why Firefox OS isn’t just for phones anymore. This week at the Consumer Electronics Show (CES) in Las Vegas, Panasonic announced that the operating system will be used in a new smart TV. As LinuxGizmos pointed out, HTML5 is central to this decision. “…Firefox OS will provide better interoperability with HTML5-enabled devices such as Firefox OS phones, and although they don’t mention it, other HTML5-based devices such as future Tizen phones. The well-honed support for HTML5 and other web technologies will also provide better integration with cloud services, including ‘personalized and optimized access to Web and broadcasting content and services through the Internet,’ says Panasonic. Specific features include multiple profiles for different TV viewers within a household. Also at CES, Mozilla announced that the OS will begin appearing on more upscale phones and tablets, although the focus will remain on emerging markets and entry level phones. None of this surprises me, not since I heard Jason Weathersby speak at the All Things Open conference in October. Jason works for Mozilla as a technical evangelist for Firefox OS. From the start of his presentation, it was obvious that the operating system wasn’t being ignored by the mobile industry, as many people had expected. Here’s why this is important. The Firefox OS design means that developers pretty much don’t have to work with anything other than HTML5 to develop apps for Firefox phones–or for anything else running Firefox OS. What could be simpler? What could be more open? There’s no walled garden here, as there is with iOS. It’s more open than Android, the reigning Linux mobile distro at the moment. The browser-as-operating-system concept that frightened the folks in Redmond back in the Netscape days is finally here. Unlike Chrome OS, it’s not cloud based–the browser is used to run local as well as network apps. If it’s already going to be on televisions and other devices, it’s only a matter of time before it’ll appear on laptops and desktops. If I were Microsoft, I’d find this to be yet another reason to worry. Well, I can recall the days when I rand a BBS, and the BBS WAS a powerful shell on DOS, with built in text editors, etc. We’re seeing a big change in the industry, Indie games giving us the originality that AAA Games lack and Operating Systems like Linux giving us our freedom and privacy at prices and friendly ways companies like Apple and Microsoft can’t offer. Out with the old and in with the new. We all knew Microsoft and Apple couldn’t stay on top forever; it was just a matter of time. But I thought Mozilla was subsidised by Google. What are they going to say? This is what will make it useful, and therefore a more interesting and competitive system on laptops and even tablets, where ChromeOS is not. @tracyanne39 I believe ChromeOS can run local HTML5 apps as well. It can also run Chrome ‘native’ binary apps. Not sure whether Firefox OS supports (or encourages) devices with more local storage than Chromebooks, but the two OS’s are pretty similar in their capabilities. ChromeOS focuses on providing good performance on low-ish end hardware. I’m not sure what the focus of Firefox OS is – other than maintaining the relevance of Firefox as a browser. And I say that as a Firefox user on Linux and Windows. Chrome’s nice, but I still like FF better. But I’m not sure I see much use for a FF OS. I’m all for it. The reason Mozilla, and later its Firefox incarnation, became so popular in the first place is that it’s Free Software that supports truly open standards. Hopefully the same will be true for Firefox OS. For the record, I have one of those $80 Firefox OS phones. Is it an Ubuntu Edge? Nope. But it sure does the job of the basics pretty well. The phone works. The camera works. The sound/video playback works. The wireless Internet connectivity works. Add a standard 32GB micro-SD card for storage; that works. That’s really all I need, and everything I need works. Hard for me to argue with such a proposition. So, for me, it’s hard to beat this little $80 phone. Good work, Mozilla and ZTE. The “public” as you call it really had no clue what the internet was prior to the abomination known as AOL. As @littlenoodles said, ChromeOS also runs local apps, they are called packaged apps. Our startup works with both Chrome and Firefox OS packaged apps. Unfortunately these are incompatible. What is more, although they both offer Device Access APIs, yay!, those APIs are incompatible too. Do not get me wrong, we love what Mozilla is doing with FirefoxOS, as Chrome packaged apps do not work on mobiles yet, but you have to be realistic about what you are getting into. The debugger for FirefoxOS apps is buggy and is way behind the Chrome Dev Tools remote debugger. Some dev tools, like Timeline, crucial for debugging layout, reflow and animation, do not exist in Firefox Debugger. ZTE is a cool and functional device for basics. I love its battery life, it lasts a week or more with light use, but it is very slow for more complex apps (we had to do a lot of architectural work to make our apps perform decently), it has a crappy touch screen, and it is not as dev friendly as you might think. I got mine from eBay and for Firefox Debugger to connect to it I needed to jump through hoops updating its firmware and then updating the OS from Firefox OS 1.01 to 1.2. Even with the 1.2 update browser engine is way behind the current version of Firefox for desktop and Android. Mozilla announced about 3 months ago that they will sync up versions but this is not happening yet. For example, we were hoping for WebRTC to work on it, like it does on Firefox Android and Chrome Android, but this is scheduled for Firefox OS 1.4 (with some bits of it may be landing in the upcoming 1.3). We invested a lot of resources in making a Skype-like app for Firefox OS but then had to postpone it. But since there is no over-the-air-update for ZTE Open, I will again be killing myself to get the new version to a device. So, you have to be realistic, patient and persistent when committing to Firefox OS, which I and my team are. We are in touch with Mozilla devs and they are super helpful and friendly. Saying Android is a Linux distribution is like saying an aircraft carrier can go Mach 3. The Android VM runs on Linux or Windows like bluestacks for example. based on your reasoning, KUbuntu is not a Linux distribution, because KDE4, and therefore KDE apps, runs on top of Windows.